A man suffered fatal injuries at a home in Derbyshire, sparking a murder investigation. 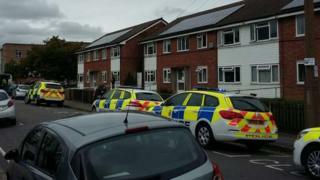 Police were called to West Park Court, in Broad Street, Long Eaton at 11:05 BST on Tuesday. A 46-year-old man has been arrested on suspicion of murder and remains in custody. A Derbyshire Police spokesman said when officers arrived, a man was found with fatal injuries and he was pronounced dead at the scene. Officers are asking anyone with information to contact them.